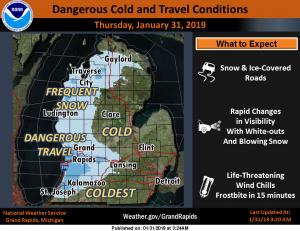 From the National Weather Service: Dangerous travel will persist across much of West Michigan throughout the day. Expect snow showers with rapid changes to visibility (near zero at times), intense bursts of snow, gusty winds, and snow covered roads. Temperatures will be life-threatening to those caught outside, with wind chills tonight through Thursday morning between -20 and -40. Frostbite may occur in less than 15 minutes.